Reviews on all things educational, including books, reading programs, special ed. products, special education services, guided reading, reading levels…and more. Since writing this review, I have become a classroom teacher and have witnessed and/or peformed the sharpening of thousands of different pencils. When I did this review on best pencil sharpener I researched the numerous Amazon reviews and came to the conclusion that is the one pencil sharpener that consistently receives the highest rating. Now, I can affirm that the contest isn’t even close. 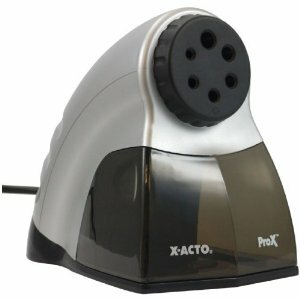 The X-ACTO PROX is hands-down better than any other pencil sharpener I’ve ever tried. You can sharpen a brand new, completely unsharpened pencil (depending on brand), in around 5-6 seconds. The X-ACTO ProX is less than half the price as the Panasonic KP150BK. Like the KP150BK, the X-ACTO has a steel cutting wheel and an auto-shut-off feature to prevent over sharpening of your pencils. Another great feature is LED illumination which indicates when sharpening is complete. The X-ACTO has a larger receptacle for pencil shaving and a multi-wheel dial for selecting different sizes of pencils. These are features the KP150BK doesn’t. The best part is the $59.00 price tag. But wait, it gets even better than that. You can get them the XACTO PROX for around $58.00 on Amazon. I bought this pencil sharpener about 18 months ago and dozens of students have used it. We go through a lot of pencils. I estimate that we’ve sharpened well 2,000 pencils with this unit. So far, it hasn’t failed. Prior to this I tried a couple of other electric pencil sharpeners such as the Wescott Evolution iPoint sold at Costco for around $15.00. I went through two of these. They are cheap, but they are noisy and they break. Other teachers have used these as well and have complained about how many times they have failed. At the failure rate of other cheap, electric pencil sharpeners, I would say that the $58.00 XACTO will actually save you some money in the long-run. But, most importantly, getting the right pencil sharpener will save you a lot of grief and headaches from the noise. – back in the day when I thought pencil sharpeners were for Crossword Puzzles. If there is a more important product for aiding the technology and communications needs of those who are visually impaired, it would be hard to imagine. Jaws Screen Reader makes personal computing possible for those who cannot see. For those of us who are blessed with site, it is hard to imagine what it would be like to face a computer without seeing the words on your screen much less make full use of word processing, spread sheets, email, internet browsing and many of the other software applications those of us blessed with sight take for granted.. The Jaws program was designed for computer users whose loss of vision prevents them from reading the content on the screen of their PC Desktop or Laptop. I became familiar with the Jaws Screen Reader software through a blind customer of mine. My client sells computers as part of a bigger, visual-aid solution. His customers buy and use the same computers as my seeing customers. For the visually impaired, receiving a computer that does not have the Jaws software pre-installed is about as good as buying a brick.. For that reason, his computers are shipped to me, first, and I install the Jaws software for him. When his customers receive a system with Jaws preinstalled, they can remove the computer from the box and begin using it immediately. The program works with just about all of today’s popular software applications: Internet Explorer, Fire Fox, Word Perfect, Corel, Lotus Apps, Adobe Acrobat, MSN Messenger and more. The Jaws software uses two, multilingual speech synthesizers which provide very natural, easy-to-understand speech of everything that is read on your screen. But Jaws does not merely just read data and applications text, it also turns all of your mouse-driven system commands into speech making it possible for the visually impaired to easily navigate windows menus and tasks. I am impressed with how quickly the program responds to the movement of your mouse. It never seems to miss a beat. The reader voice can be turned up as fast or slow as you want it. It is amazing how quickly my customer can read emails while speaking with me on the telephone. Thanks to Jaws, his lack of site does not hasten his ability to work or read data on the computer. Jaws is equipped with a refreshable Braille display. So, you can use the program to provide Braille output in place or addition to speech. The software produces several RealSpeak Solo Direct voices in different accents and languages which can be downloaded from their site. For instance you can choose between several variations of female-speaking or British voice accents, or numerous different languages; Indian, Spanish, Danish, German, Italian, etc. Jaws is also compatible with the MAGic Screen Magnification Software; a cool piece of software that can magnify the text and images on your screen by up to 36 times! If you think a program that is so powerful and useful might cost a pretty penny, you’re right. The Jaws Screen Reader Software isn’t cheap. You can buy the Pro version for $1,095 or the Standard Version for $895.00. The only difference I could see from the website of the makers of Jaws, Freedom Scientific, is that the Pro version works with Windows 2003 and Windows 2008 Server Operating Systems. There is also Multi-User License pricing for the product. See, the Freedom Scientific website for more information on the Jaws Screen Reader software. I normally don’t do much in the way of book reviews, but I will make an exception with this one. This particular story had such a powerful and positive impact on me that I felt compelled to talk about it and persuade you to buy the book and read it for yourself. A Small Italian Life is not only an inspiring and touching biography, but a powerfully, captivating success story. There is a lesson in this book for everyone, regardless of your age, background and family. Author, Jimmy Corso, overcame great adversity and disadvantages as a child to become a very successful teacher and role model for society. His book reminds us that true success isn’t measured in terms of money or how famous we become. His book teaches us what it takes to succeed in life at any level. What he calls a “A Small Italian Life” in reality, is a bigger-than-life-lesson for all of us. Jimmy Corso’s story teaches us that it’s not what life gives us that counts, but what we are willing to give of ourselves in life to succeed. Reading this book, I was amazed by how a boy with seemingly so little good fortune maintained such a fierce desire and commitment to succeed. His father was an alcoholic and his mother mentally ill. He and his parents were told by the school teachers that with an IQ of just 70, he would never be able to join the rest of his classmates. He was relegated to special education programs, then put back a couple of grades in later school years. As you read about his struggles with his family and school education, you will wonder how he could ever have a chance to succeed. But, the more you read, the more you will see his incredible commitment to persevere. One of the things which truly impressed me was how despite all of his family problems and negative influences, Jimmy Corso remained such a decent human being. His good character, integrity and work-ethic shines through in his book, from childhood to adulthood. While the book is indeed an inspiration and lesson in life, I don’t want to sell it short, by limiting it to just that. The story is a fascinating and colorful account of Jimmy Corso’s life and it is filled with rich details, characters, plots and history of the times. Once I turned the first page, I didn’t want to put the book down. There is never a dull moment which explains why I finished reading the entire book the weekend I started it. Though, A Small Italian Life, is not really a book about sports, it provides much of the same joys you might get from a sports story like Rudy, Cinderella Man or the recent, blockbuster hit, Blind Side. Like Jimmy Corso, the heros in these sports stories fought through adversity and overcame tremendous odds to win the battle in the end. 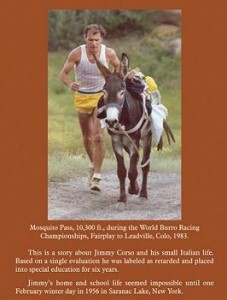 When you think of the profound, positive influence on the thousands of children taught by the author of this touching story, you will agree with me that Jimmy Corso is a true, American hero. The book is a story that will continue to teach generations to come. The Read Naturally Program is guided reading software. Why do some children learn to read faster and more fluently than others? The answer is that they are natural readers. We are much better at doing and enjoying the things that come natural to us. Imagine if we gave up bike riding the first time we tried it because we fell to the ground. For most of us, attempting to ride a bike the first time was probably not an experience we enjoyed and it may have even been painful. For some of us, it took lots of prodding, encouragement and courage before we could get back on the bike for a second try. With the proper encouragement and training, bike riding became easier, more natural and eventually turned into an activity that most of us looked forward to and enjoyed doing. Is it any different with reading? Some catch on faster than others. Imagine how it is for some children learning to read the first time. The less natural the experience, the less desirable and easy it is for beginners to learn. For those of us who really struggled to read in the beginning, we needed that same encouragement, help and practice we got when learning to ride our bikes. We wouldn’t tell our kids they can’t ride a bike just because they fell off of it their first time. Neither should we tell a struggling child or student that reading is an activity that can never become as natural and enjoyable to do as riding a bike. Such is the philosophy behind the read naturally program. With the proper training, encouragement and practice, even the most challenged student can become a natural reader and learn to enjoy it. So, given that we agree on the concept behind the read naturally idea, what method or system can give us the desired results? The Read Naturally strategy includes three ways: Teacher Modeling, Repeated Reading and Progress Monitoring. A summary of each will provide insight into what the Read Naturally Program is, how it works and it’s effectiveness as a tool for teachers and students. You saw your Dad or a friend ride a bike, so you knew it could be done, and saw how it was done. We learn by example: Seeing and hearing, then ultimately doing what we saw and heard. Teacher modeling is the training wheels of the Read Naturally strategy. Is it really enough to push books and stories in front of a challenged or beginning reader and make them stumble through it their first time? There may be some improvement in this old-fashioned approach, but the gains are likely to be very slow and a great work of labor for both teacher and student. Also, without guided reading, and a program of reading levels, how do teachers know that progress is being made? Teacher modeling involves reading out loud, while the student follows along with the text of a story. The student is able to gain a better understanding of what they are reading by hearing the pronunciation, expression and learning the vocabulary while it is spoken. Teacher modeling is accomplished through audio CDs or Tapes, allowing the class instructor to be free to work with other students own reading levels at the same time. What comes next is practice. Was it enough to ride the bike 20 feet your first time without falling, or did you need to practice it a few times to get the hang of it? Also, once you got your balance going straight, you had to learn how to make turns, peddle-faster, brake and get on and off without falling. After hearing a teacher model the story, students can practice reading the same story over and over again on their own. Gradually, the student catches on. When it becomes natural to them, they are ready to move on to a more challenging story or reading level. Knowing when a student is ready is the third step of the read naturally program. I remember watching my daughter teach my son to ride a bike for the first time. She would guide him a long a ways, little by little, and then watch him try on his own until he got his balance and could go straight for a few feet at a time. As she monitored his progress along the way, she would give him new goals, pushing him to go farther and having him try turns, stops and hills. Progress Monitoring lets the teacher know when the student is ready for new goals. The student is rewarded by seeing their own progress and encouraged to go farther and try new reading challenges, just as the beginning bike rider. The goal of Teacher Modeling, Repeated Reading and Progress Monitoring is to make natural readers of students, especially those with special needs. So, what specific products are included in the Read Naturally program and how are they used? While the Read Naturally Strategy provides seven different products, the focus of this review is on the Read Naturally Master Edition (ME). The goal of all these products is to improve reading fluency through phonemic awareness, phonics, fluency, vocabulary and comprehension, using the Teacher Modeling, Repeated Reading and Progress Monitoring strategy described above. Teachers and schools can choose any one or a combination of these products they feel are best for obtaining the results for students at a variety of different skill levels. My wife, a special education teacher, uses the Read Naturally products at her school. She brought the Sequence Series of the (ME) products home to demonstrate. I was literally blown away by the number of stories included. The Sequence Series includes 13 different reading levels, each having 24 stories. Of the five different series, the entire (ME) product line, alone, includes over one thousand stories. I read the story, Northern Lights, which is among the 24 stories in level 5.6. After reading the story, I listened to the audio CD. The quality of the recording is excellent and very well read by the narrator. All of the stories are well written, interesting and enjoyable to read. Listening to the narrator read these stories with the appropriate expression will definitely help children gain an appreciation and understanding of how to read. Also, I can see how having the students repeat the story a number of times, then grading their progress will add to their confidence and ability to become more fluent readers. Teachers will be rewarded as they watch struggling readers improve on both their cold and hot reading scores. The price for one 24-story level with 12 Audio CDs costs $119.00. When you consider how many hundreds of students, year after year, will benefit from reading and listening to these excellent, well-written stories and professionally produced recordings, the cost for purchasing an entire series is a worthwhile investment with immeasurable long-term value. The Phonics and Spanish Series include 6 levels. American Manners and Idioms each offer 4 levels, and the Multi-Cultural series includes two; African American and Mexican American History. I think you’d be hard pressed to find a school teacher or instructor who doesn’t believe in the Read Naturally strategy and enjoy teaching the program. When you divide the cost of an entire Read Naturally Series by the number of students who will reap the benefits, it is one of the most affordable educational investments a school can possibly make.